He is said to manifest vibuthi (holy ash) and small objects like rings and watches daily. He claims to materialize these objects out of nothing. These claims are believed and testified to by his followers. Sacred ash, amrit (honey), kumkum, sandle paste, fragrances, flowers and even letters are reported as materializing from his pictures all around the world. In addition, the followers, and even many non-followers, have testified about many miracles and cures performed by him. 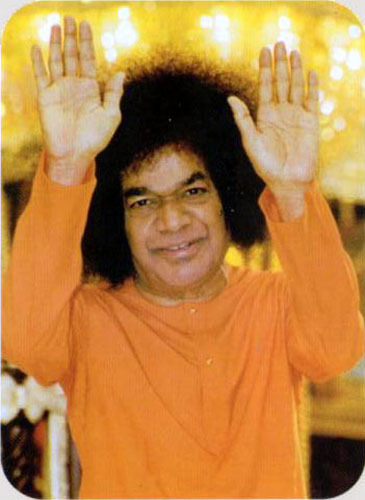 He preaches a foundation of five basic values: Truth (Sathya), Right Conduct (Dharma), Peace (Shanti), Love (Prema) and Non-violence (Ahimsa). He teaches the unity of all major world religions and says that they all lead to God. His followers and the organizations that he has founded are involved in many charity projects, providing free modern hospitals and water projects serving thousands in the Indian state of Andhra Pradesh and the city of Chennai (Madras). In his ashram and around it there are various buildings including a University and a World Religions Museum. He has founded schools all over India and his "values-teaching methods" are slowly being implemented in other countries.